This article is about spin in quantum mechanics. For rotation in classical mechanics, see angular momentum. In quantum mechanics and particle physics, spin is an intrinsic form of angular momentum carried by elementary particles, composite particles (hadrons), and atomic nuclei. Spin is one of two types of angular momentum in quantum mechanics, the other being orbital angular momentum. The orbital angular momentum operator is the quantum-mechanical counterpart to the classical angular momentum of orbital revolution and appears when there is periodic structure to its wavefunction as the angle varies. The existence of spin angular momentum is inferred from experiments, such as the Stern–Gerlach experiment, in which silver atoms were observed to possess two possible discrete angular momenta despite having no orbital angular momentum. In some ways, spin is like a vector quantity; it has a definite magnitude, and it has a "direction" (but quantization makes this "direction" different from the direction of an ordinary vector). All elementary particles of a given kind have the same magnitude of spin angular momentum, which is indicated by assigning the particle a spin quantum number. The SI unit of spin is the (N·m·s) or (kg·m2·s−1), just as with classical angular momentum. In practice, spin is given as a dimensionless spin quantum number by dividing the spin angular momentum by the reduced Planck constant ħ, which has the same units of angular momentum, although this is not the full computation of this value. Very often, the "spin quantum number" is simply called "spin", leaving its meaning as the unitless "spin quantum number" to be inferred from context. When combined with the spin-statistics theorem, the spin of electrons results in the Pauli exclusion principle, which in turn underlies the periodic table of chemical elements. Wolfgang Pauli in 1924 was the first to propose a doubling of electron states due to a two-valued non-classical "hidden rotation". In 1925, George Uhlenbeck and Samuel Goudsmit at Leiden University suggested the simple physical interpretation of a particle spinning around its own axis, in the spirit of the old quantum theory of Bohr and Sommerfeld. Ralph Kronig anticipated the Uhlenbeck-Goudsmit model in discussion with Hendrik Kramers several months earlier in Copenhagen, but did not publish. The mathematical theory was worked out in depth by Pauli in 1927. When Paul Dirac derived his relativistic quantum mechanics in 1928, electron spin was an essential part of it. = h/2π is the reduced Planck constant. In contrast, orbital angular momentum can only take on integer values of s; i.e., even-numbered values of n.
Those particles with half-integer spins, such as 1/2, 3/2, 5/2, are known as fermions, while those particles with integer spins, such as 0, 1, 2, are known as bosons. The two families of particles obey different rules and broadly have different roles in the world around us. A key distinction between the two families is that fermions obey the Pauli exclusion principle; that is, there cannot be two identical fermions simultaneously having the same quantum numbers (meaning, roughly, having the same position, velocity and spin direction). In contrast, bosons obey the rules of Bose–Einstein statistics and have no such restriction, so they may "bunch together" even if in identical states. Also, composite particles can have spins different from their component particles. For example, a helium atom in the ground state has spin 0 and behaves like a boson, even though the quarks and electrons which make it up are all fermions. Quarks and leptons (including electrons and neutrinos), which make up what is classically known as matter, are all fermions with spin 1/2. The common idea that "matter takes up space" actually comes from the Pauli exclusion principle acting on these particles to prevent the fermions that make up matter from being in the same quantum state. Further compaction would require electrons to occupy the same energy states, and therefore a kind of pressure (sometimes known as degeneracy pressure of electrons) acts to resist the fermions being overly close. Elementary fermions with other spins (3/2, 5/2, etc.) are not known to exist. Elementary particles which are thought of as carrying forces are all bosons with spin 1. They include the photon which carries the electromagnetic force, the gluon (strong force), and the W and Z bosons (weak force). The ability of bosons to occupy the same quantum state is used in the laser, which aligns many photons having the same quantum number (the same direction and frequency), superfluid liquid helium resulting from helium-4 atoms being bosons, and superconductivity where pairs of electrons (which individually are fermions) act as single composite bosons. Elementary bosons with other spins (0, 2, 3, etc.) were not historically known to exist, although they have received considerable theoretical treatment and are well established within their respective mainstream theories. In particular, theoreticians have proposed the graviton (predicted to exist by some quantum gravity theories) with spin 2, and the Higgs boson (explaining electroweak symmetry breaking) with spin 0. Since 2013, the Higgs boson with spin 0 has been considered proven to exist. It is the first scalar elementary particle (spin 0) known to exist in nature. The spin-statistics theorem states (1) that particles with half-integer spin (fermions) obey Fermi–Dirac statistics and the Pauli Exclusion Principle, and (2) that particles with integer spin (bosons) obey Bose–Einstein statistics, occupy "symmetric states", and thus can share quantum states. The theorem relies on both quantum mechanics and the theory of special relativity, and this connection between spin and statistics has been called "one of the most important applications of the special relativity theory". Schematic diagram depicting the spin of the neutron as the black arrow and magnetic field lines associated with the neutron magnetic moment. The neutron has a negative magnetic moment. While the spin of the neutron is upward in this diagram, the magnetic field lines at the center of the dipole are downward. Particles with spin can possess a magnetic dipole moment, just like a rotating electrically charged body in classical electrodynamics. These magnetic moments can be experimentally observed in several ways, e.g. by the deflection of particles by inhomogeneous magnetic fields in a Stern–Gerlach experiment, or by measuring the magnetic fields generated by the particles themselves. where the dimensionless quantity gs is called the spin g-factor. For exclusively orbital rotations it would be 1 (assuming that the mass and the charge occupy spheres of equal radius). The electron, being a charged elementary particle, possesses a nonzero magnetic moment. One of the triumphs of the theory of quantum electrodynamics is its accurate prediction of the electron g-factor, which has been experimentally determined to have the value 2999799768069563780♠−2.0023193043622(15), with the digits in parentheses denoting measurement uncertainty in the last two digits at one standard deviation. The value of 2 arises from the Dirac equation, a fundamental equation connecting the electron's spin with its electromagnetic properties, and the correction of 6997231930400000000♠0.002319304... arises from the electron's interaction with the surrounding electromagnetic field, including its own field. Composite particles also possess magnetic moments associated with their spin. In particular, the neutron possesses a non-zero magnetic moment despite being electrically neutral. This fact was an early indication that the neutron is not an elementary particle. In fact, it is made up of quarks, which are electrically charged particles. The magnetic moment of the neutron comes from the spins of the individual quarks and their orbital motions. where the μν are the neutrino magnetic moments, mν are the neutrino masses, and μB is the Bohr magneton. New physics above the electroweak scale could, however, lead to significantly higher neutrino magnetic moments. It can be shown in a model independent way that neutrino magnetic moments larger than about 10−14 μB are “unnatural” because they would also lead to large radiative contributions to the neutrino mass. Since the neutrino masses are known to be at most about 1 eV, the large radiative corrections would then have to be “fine-tuned” to cancel each other, to a large degree, and leave the neutrino mass small. The measurement of neutrino magnetic moments is an active area of research. Experimental results have put the neutrino magnetic moment at less than 6990120000000000000♠1.2×10−10 times the electron's magnetic moment. 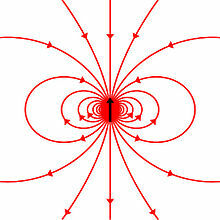 In ordinary materials, the magnetic dipole moments of individual atoms produce magnetic fields that cancel one another, because each dipole points in a random direction, with the overall average being very near zero. Ferromagnetic materials below their Curie temperature, however, exhibit magnetic domains in which the atomic dipole moments are locally aligned, producing a macroscopic, non-zero magnetic field from the domain. These are the ordinary "magnets" with which we are all familiar. In paramagnetic materials, the magnetic dipole moments of individual atoms spontaneously align with an externally applied magnetic field. In diamagnetic materials, on the other hand, the magnetic dipole moments of individual atoms spontaneously align oppositely to any externally applied magnetic field, even if it requires energy to do so. The study of the behavior of such "spin models" is a thriving area of research in condensed matter physics. For instance, the Ising model describes spins (dipoles) that have only two possible states, up and down, whereas in the Heisenberg model the spin vector is allowed to point in any direction. These models have many interesting properties, which have led to interesting results in the theory of phase transitions. where Sz is the spin component along the z-axis, sz is the spin projection quantum number along the z-axis. One can see that there are 2s + 1 possible values of sz. The number "2s + 1" is the multiplicity of the spin system. For example, there are only two possible values for a spin-1/2 particle: sz = +1/2 and sz = −1/2. These correspond to quantum states in which the spin component is pointing in the +z or −z directions respectively, and are often referred to as "spin up" and "spin down". For a spin-3/2 particle, like a delta baryon, the possible values are +3/2, +1/2, −1/2, −3/2. A single point in space can spin continuously without becoming tangled. Notice that after a 360-degree rotation, the spiral flips between clockwise and counterclockwise orientations. It returns to its original configuration after spinning a full 720 degrees.
. This vector then would describe the "direction" in which the spin is pointing, corresponding to the classical concept of the axis of rotation. It turns out that the spin vector is not very useful in actual quantum mechanical calculations, because it cannot be measured directly: sx, sy and sz cannot possess simultaneous definite values, because of a quantum uncertainty relation between them. However, for statistically large collections of particles that have been placed in the same pure quantum state, such as through the use of a Stern–Gerlach apparatus, the spin vector does have a well-defined experimental meaning: It specifies the direction in ordinary space in which a subsequent detector must be oriented in order to achieve the maximum possible probability (100%) of detecting every particle in the collection. For spin-1/2 particles, this maximum probability drops off smoothly as the angle between the spin vector and the detector increases, until at an angle of 180 degrees—that is, for detectors oriented in the opposite direction to the spin vector—the expectation of detecting particles from the collection reaches a minimum of 0%. As a qualitative concept, the spin vector is often handy because it is easy to picture classically. For instance, quantum mechanical spin can exhibit phenomena analogous to classical gyroscopic effects. For example, one can exert a kind of "torque" on an electron by putting it in a magnetic field (the field acts upon the electron's intrinsic magnetic dipole moment—see the following section). The result is that the spin vector undergoes precession, just like a classical gyroscope. This phenomenon is known as electron spin resonance (ESR). The equivalent behaviour of protons in atomic nuclei is used in nuclear magnetic resonance (NMR) spectroscopy and imaging. Mathematically, quantum-mechanical spin states are described by vector-like objects known as spinors. There are subtle differences between the behavior of spinors and vectors under coordinate rotations. For example, rotating a spin-1/2 particle by 360 degrees does not bring it back to the same quantum state, but to the state with the opposite quantum phase; this is detectable, in principle, with interference experiments. To return the particle to its exact original state, one needs a 720-degree rotation. (The Plate trick and Möbius strip give non-quantum analogies.) A spin-zero particle can only have a single quantum state, even after torque is applied. Rotating a spin-2 particle 180 degrees can bring it back to the same quantum state and a spin-4 particle should be rotated 90 degrees to bring it back to the same quantum state. The spin-2 particle can be analogous to a straight stick that looks the same even after it is rotated 180 degrees and a spin 0 particle can be imagined as sphere, which looks the same after whatever angle it is turned through. where S± = Sx ± i Sy. But unlike orbital angular momentum the eigenvectors are not spherical harmonics. They are not functions of θ and φ. There is also no reason to exclude half-integer values of s and ms.
One distinguishes bosons (integer spin) and fermions (half-integer spin). The total angular momentum conserved in interaction processes is then the sum of the orbital angular momentum and the spin. Thus, for bosons the prefactor (−1)2s will reduce to +1, for fermions to −1. In quantum mechanics all particles are either bosons or fermions. In some speculative relativistic quantum field theories "supersymmetric" particles also exist, where linear combinations of bosonic and fermionic components appear. In two dimensions, the prefactor (−1)2s can be replaced by any complex number of magnitude 1 such as in the anyon. The above permutation postulate for N-particle state functions has most-important consequences in daily life, e.g. the periodic table of the chemical elements. , and S is the vector of spin operators. as expected. Note that since we only relied on the spin operator commutation relations, this proof holds for any dimension (i.e., for any principal spin quantum number s). Recalling that a generic spin state can be written as a superposition of states with definite m, we see that if s is an integer, the values of m are all integers, and this matrix corresponds to the identity operator. However, if s is a half-integer, the values of m are also all half-integers, giving (−1)2m = −1 for all m, and hence upon rotation by 2π the state picks up a minus sign. This fact is a crucial element of the proof of the spin-statistics theorem. We could try the same approach to determine the behavior of spin under general Lorentz transformations, but we would immediately discover a major obstacle. Unlike SO(3), the group of Lorentz transformations SO(3,1) is non-compact and therefore does not have any faithful, unitary, finite-dimensional representations. , etc), provided that no measurements of the spin are made along other axes. The operator Su has eigenvalues of ±ħ/2, just like the usual spin matrices. This method of finding the operator for spin in an arbitrary direction generalizes to higher spin states, one takes the dot product of the direction with a vector of the three operators for the three x-, y-, z-axis directions. The above spinor is obtained in the usual way by diagonalizing the σu matrix and finding the eigenstates corresponding to the eigenvalues. In quantum mechanics, vectors are termed "normalized" when multiplied by a normalizing factor, which results in the vector having a length of unity. respectively). This implies that the original measurement of the spin along the x-axis is no longer valid, since the spin along the x-axis will now be measured to have either eigenvalue with equal probability. The spin-1/2 operator S = ħ/2σ forms the fundamental representation of SU(2). By taking Kronecker products of this representation with itself repeatedly, one may construct all higher irreducible representations. That is, the resulting spin operators for higher spin systems in three spatial dimensions, for arbitrarily large s, can be calculated using this spin operator and ladder operators. Also useful in the quantum mechanics of multiparticle systems, the general Pauli group Gn is defined to consist of all n-fold tensor products of Pauli matrices. for higher spins is tractable, but less simple. In tables of the spin quantum number s for nuclei or particles, the spin is often followed by a "+" or "−". This refers to the parity with "+" for even parity (wave function unchanged by spatial inversion) and "−" for odd parity (wave function negated by spatial inversion). For example, see the isotopes of bismuth in which the List of isotopes includes the column Nuclear spin and parity. For Bi-209, the only stable isotope, the entry 9/2– means that the nuclear spin is 9/2 and the parity is odd. Giant magnetoresistive (GMR) drive head technology in modern hard disks. Electron spin plays an important role in magnetism, with applications for instance in computer memories. The manipulation of nuclear spin by radiofrequency waves (nuclear magnetic resonance) is important in chemical spectroscopy and medical imaging. Spin-orbit coupling leads to the fine structure of atomic spectra, which is used in atomic clocks and in the modern definition of the second. Precise measurements of the g-factor of the electron have played an important role in the development and verification of quantum electrodynamics. Photon spin is associated with the polarization of light. An emerging application of spin is as a binary information carrier in spin transistors. The original concept, proposed in 1990, is known as Datta-Das spin transistor. Electronics based on spin transistors are referred to as spintronics. The manipulation of spin in dilute magnetic semiconductor materials, such as metal-doped ZnO or TiO2 imparts a further degree of freedom and has the potential to facilitate the fabrication of more efficient electronics. There are many indirect applications and manifestations of spin and the associated Pauli exclusion principle, starting with the periodic table of chemistry. Spin was first discovered in the context of the emission spectrum of alkali metals. In 1924 Wolfgang Pauli introduced what he called a "two-valuedness not describable classically" associated with the electron in the outermost shell. This allowed him to formulate the Pauli exclusion principle, stating that no two electrons can have the same quantum state in the same quantum system. The physical interpretation of Pauli's "degree of freedom" was initially unknown. Ralph Kronig, one of Landé's assistants, suggested in early 1925 that it was produced by the self-rotation of the electron. When Pauli heard about the idea, he criticized it severely, noting that the electron's hypothetical surface would have to be moving faster than the speed of light in order for it to rotate quickly enough to produce the necessary angular momentum. This would violate the theory of relativity. Largely due to Pauli's criticism, Kronig decided not to publish his idea. In the autumn of 1925, the same thought came to two Dutch physicists, George Uhlenbeck and Samuel Goudsmit at Leiden University. Under the advice of Paul Ehrenfest, they published their results. It met a favorable response, especially after Llewellyn Thomas managed to resolve a factor-of-two discrepancy between experimental results and Uhlenbeck and Goudsmit's calculations (and Kronig's unpublished results). This discrepancy was due to the orientation of the electron's tangent frame, in addition to its position. Mathematically speaking, a fiber bundle description is needed. The tangent bundle effect is additive and relativistic; that is, it vanishes if c goes to infinity. It is one half of the value obtained without regard for the tangent space orientation, but with opposite sign. Thus the combined effect differs from the latter by a factor two (Thomas precession). Despite his initial objections, Pauli formalized the theory of spin in 1927, using the modern theory of quantum mechanics invented by Schrödinger and Heisenberg. He pioneered the use of Pauli matrices as a representation of the spin operators, and introduced a two-component spinor wave-function. Pauli's theory of spin was non-relativistic. However, in 1928, Paul Dirac published the Dirac equation, which described the relativistic electron. In the Dirac equation, a four-component spinor (known as a "Dirac spinor") was used for the electron wave-function. In 1940, Pauli proved the spin-statistics theorem, which states that fermions have half-integer spin and bosons have integer spin. In retrospect, the first direct experimental evidence of the electron spin was the Stern–Gerlach experiment of 1922. However, the correct explanation of this experiment was only given in 1927. ^ Merzbacher, Eugen (1998). Quantum Mechanics (3rd ed.). pp. 372–3. ^ a b Griffiths, David (2005). Introduction to Quantum Mechanics (2nd ed.). pp. 183–4. ^ Eisberg, Robert; Resnick, Robert (1985). Quantum Physics of Atoms, Molecules, Solids, Nuclei, and Particles (2nd ed.). pp. 272–3. ^ Pais, Abraham (1991). Niels Bohr's Times. Oxford: Clarendon Press. p. 201. ISBN 978-0-19-852049-8. ^ a b Pais, Abraham (1991). Niels Bohr's Times. Oxford: Clarendon Press. pp. 241–244. ISBN 978-0-19-852049-8. ^ Information about Higgs Boson in CERN's official website. ^ Pauli, Wolfgang (1940). "The Connection Between Spin and Statistics" (PDF). Phys. Rev. 58 (8): 716–722. Bibcode:1940PhRv...58..716P. doi:10.1103/PhysRev.58.716. ^ "CODATA Value: electron g factor". The NIST Reference on Constants, Units, and Uncertainty. NIST. 2006. Retrieved 2013-11-15. ^ Feynman, R.P. (1985). "Electrons and their interactions". QED: The Strange Theory of Light and Matter. Princeton, New Jersey: Princeton University Press. p. 115. ISBN 978-0-691-08388-9. After some years, it was discovered that this value [−½ g] was not exactly 1, but slightly more – something like 1.00116 . This correction was worked out for the first time in 1948 by Schwinger as j×j divided by 2 π [sic] [where j is the square root of the fine-structure constant], and was due to an alternative way the electron can go from place to place: Instead of going directly from one point to another, the electron goes along for a while and suddenly emits a photon; then (horrors!) it absorbs its own photon. ^ Marciano, W.J. ; Sanda, A.I. (1977). "Exotic decays of the muon and heavy leptons in gauge theories". Physics Letters. B67 (3): 303–305. Bibcode:1977PhLB...67..303M. doi:10.1016/0370-2693(77)90377-X. ^ Lee, B.W. ; Shrock, R.E. (1977). "Natural suppression of symmetry violation in gauge theories: Muon- and electron-lepton-number nonconservation". Physical Review. D16 (5): 1444–1473. Bibcode:1977PhRvD..16.1444L. doi:10.1103/PhysRevD.16.1444. ^ K. Fujikawa, R. E. Shrock (1980). "Magnetic Moment of a Massive Neutrino and Neutrino-Spin Rotation". Physical Review Letters. 45 (12): 963–966. Bibcode:1980PhRvL..45..963F. doi:10.1103/PhysRevLett.45.963. ^ Bell, N.F. ; Cirigliano, V.; Ramsey-Musolf, M.; Vogel, P.; Wise, Mark; et al. (2005). "How Magnetic is the Dirac neutrino?". Physical Review Letters. 95 (15): 151802. arXiv:hep-ph/0504134. Bibcode:2005PhRvL..95o1802B. doi:10.1103/PhysRevLett.95.151802. PMID 16241715. ^ B.C. Hall (2013). Quantum Theory for Mathematicians. Springer. pp. 354–358. ^ Curtright, T L; Fairlie, D B; Zachos, C K (2014). "A compact formula for rotations as spin matrix polynomials". SIGMA. 10: 084. arXiv:1402.3541. Bibcode:2014SIGMA..10..084C. doi:10.3842/SIGMA.2014.084. ^ Datta. S and B. Das (1990). "Electronic analog of the electrooptic modulator". Applied Physics Letters. 56 (7): 665–667. Bibcode:1990ApPhL..56..665D. doi:10.1063/1.102730. ^ Assadi, M.H.N; Hanaor, D.A.H (2013). "Theoretical study on copper's energetics and magnetism in TiO2 polymorphs". Journal of Applied Physics. 113 (23): 233913–233913–5. arXiv:1304.1854. Bibcode:2013JAP...113w3913A. doi:10.1063/1.4811539. 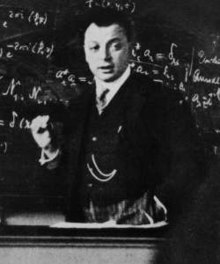 ^ Wolfgang Pauli (December 13, 1946). "Exclusion Principle and Quantum Mechanics". Nobel Lecture. Nobel Prize. ^ B. Friedrich, D. Herschbach (2003). "Stern and Gerlach: How a Bad Cigar Helped Reorient Atomic Physics". Physics Today. 56 (12): 53. Bibcode:2003PhT....56l..53F. doi:10.1063/1.1650229. Cohen-Tannoudji, Claude; Diu, Bernard; Laloë, Franck (2006). Quantum Mechanics (2 volume set ed.). John Wiley & Sons. ISBN 978-0-471-56952-7. Condon, E. U.; Shortley, G. H. (1935). "Especially Chapter 3". The Theory of Atomic Spectra. Cambridge University Press. ISBN 978-0-521-09209-8. Edmonds, A. R. (1957). Angular Momentum in Quantum Mechanics. Princeton University Press. ISBN 978-0-691-07912-7. Jackson, John David (1998). Classical Electrodynamics (3rd ed.). John Wiley & Sons. ISBN 978-0-471-30932-1. Thompson, William J. (1994). Angular Momentum: An Illustrated Guide to Rotational Symmetries for Physical Systems. Wiley. ISBN 978-0-471-55264-2. Goudsmit on the discovery of electron spin. Nature: "Milestones in 'spin' since 1896."